I’m going to write on five surprising things of St. Joseph in celebration of his feast day today. 3) St. Joseph was probably taken body-and-soul into heaven at his death. Have you ever seen a first class relic of St. Joseph? Me neither. St. Francis De Sales, a doctor of the Church, considers it definite that St. Joseph was taken body-and-soul into heaven at his death. Many such saints look to Gen 50:25 as a prophesy. Common sense dictates: Would God let his own foster father rot in the ground until His second coming? Indeed, we know that although Mary’s Assumption was unique, Mary was not the only one taken body-and-soul into heaven for a preemptive resurrection of the body. (See Gen 5:24, 2 Kings2:11 and Matt 27:53.) That St. Joseph should be among this small party of bodies in heaven is easy to believe when you consider that St. Joseph has been defined doctrinally by the magisterium as the second greatest saint. (See the writings by Pope Leo XIII.) I would have thought that the runner up to Mary would have gone to, say, St. Paul or St. Catherine of Siena. Nope. St. Joseph is the second greatest saint, even higher than the angels in glory. A simple carpenter! In fact, St. Teresa of Ávila says of St. Joseph: “I do not remember that I have ever asked anything of him which he has failed to grant.” Remember this when you pray for—and with—the dying. Since St. Joseph died with Jesus and Mary at his side, he is considered the patron of a good death. My experience is that his intercession is almost immediate. 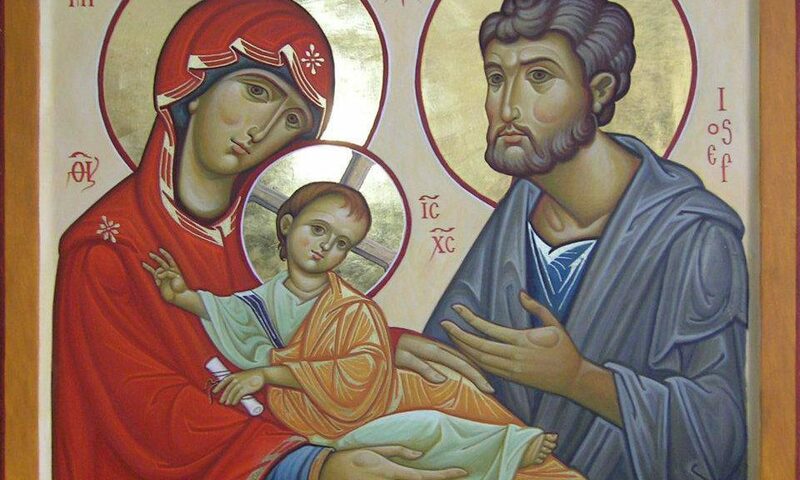 4) St. Joseph is the head of the Holy Family. This seems obvious, but think about it: St. Joseph is #3 in holiness in his family, but he is #1 in the authority of his family. Right here we have the whole Catholic answer to the issue of women’s ordination, the role of the father as the spiritual leader of the family and even the necessity of complementary roles played by two different genders in the family. Why? Because the Holy Family reveals to post-moderns that roles themselves do not imply superiority; roles prove natural law. (Natural Law is the universal law of family and morality already stamped into the heart of human beings found in any culture.) One day, we Americans may learn that the equality of dignity enjoyed by man and woman is not the same as a bland, interchangeable sameness of family members. How boring. Rather, real roles provide beauty when they are lived without chauvinism or manipulation. Mary was holier than Joseph, but that didn’t stop her from being obedient to him. In fact, Jesus—the Divine Word of the Universe—was obedient to both of them (Luke 2:51.) So, what was Joseph’s role, anyway? That of every man: To protect, guard, provide, teach, guide and love. When a woman lets a man do this, it’s not conveying inferiority. It’s letting him live the fullness of his own masculine love for his family. 5) St. Joseph is the Return of the King. If you look at St. Joseph’s genealogy in the Gospel of St. Matthew, you will see that Joseph had to be the hidden king of Israel by being a direct descendent of King David. Why didn’t anyone know it? Because David’s royalty had to go underground to give way to a corrupt Hebrew theocracy in cahoots with Greek invaders. (For more, see the Old Testament’s 1 and 2 Maccabees, aka the Jewish Braveheart…Yes, some poor Protestans took out the most exciting book in the Bible because Luther didn’t like the Purgatory reference in 2 Macc 12:39-42.) Anyway, follow closely for one more minute: St. Joseph was “King of Israel.” This is proved right there in Matt 1:6-16. He is in the direct bloodline of King David! Read it if you think that that is a title that belongs only to Jesus. In fact, Jesus being the supposed-son of the king may have been a cruel but prophetic twist on the head-placard written by Pontius Pilate at Jesus’ crucifixion: HIC EST IESUS, REX IUDAEORUM—Matt 27:37. Of course, Jesus goes beyond Joseph as the prophesied everlasting King of Israel (2 Sam 7:12-13) since Jesus is God. If you’ve read any Scott Hahn, you know that the queen of a Jewish king was not his wife, but rather His mother (1 Kings 2:19.) Thus, if Jesus is king, then the queen of Israel is clearly Mary. Put it all together and this means: For different reasons, Mary and Joseph are both hidden royalty! The royal duty of Joseph was to guard and protect his queen, Mary. But it doesn’t end there. His duty of guarding this queen was the cameo of his longer vocation to protect the Catholic Church by his intercession in heaven. Is this a pious but random connection? No. The Church’s theology is that Mary lived as the exemplar (supreme goal and example) of the Church. This means that everything St. Joseph did once for her on earth, he would do now for the Church from his spot in heaven. Now it is easy to understand why St. Joseph’s current role is to guard and protect the Church in her pilgrim state of danger here on earth. He is summoned to protect her from both theological error and real demons. We need to call on him now more than ever in this time of nearly unprecedented confusion within the Church and diabolical attack within the family (the domestic Church.) “St. Joseph, terror of demons” is ready to help us pray and act and teach as men. Lastly…I’ve traveled to missions and parishes on five continents during the past three years and I would argue that it is mostly in Western nations where people consider religion to be a “woman thing.” Not so in the Middle East, in India, in Africa. God is for both genders. Consider the witness of the 21 Egyptian Christian martyrs whose heads were sawed off with knives last month while they were still alive. (This is not “beheading” as the media erroneously calls it. “Beheading” was something merciful that Herod did to John the Baptist.) Did you know that these 21 were not ultra-religious Copts hand-picked by ISIS for torture? They were ordinary Christian men. Did you know every one of them was given the chance to verbally deny Jesus and then accept Islam? These normal fathers and husbands submitted to a gory death on the shores of Libya instead of denying our dear Savior, Jesus Christ. Beshir Kamel, a brother of two of the martyrs, later said that his brothers and friends were “a badge of honor to Christianity…ISIS gave us more than we asked when they didn’t edit out the part where they declared their faith and called upon Jesus Christ. ISIS helped us strengthen our faith.” Yes, this was the year 2015. Perhaps it is no coincidence that both Josephs of the Bible have blessed the sands of Egypt by their courageous and manly witness when compromise could have “saved” them. St. Joseph, genetically so close to these modern heroes and martyrs of Libya/Egypt, pray for similar men to be raised up in the Church of the Americas. —I originally wrote this article for Those Catholic Men.